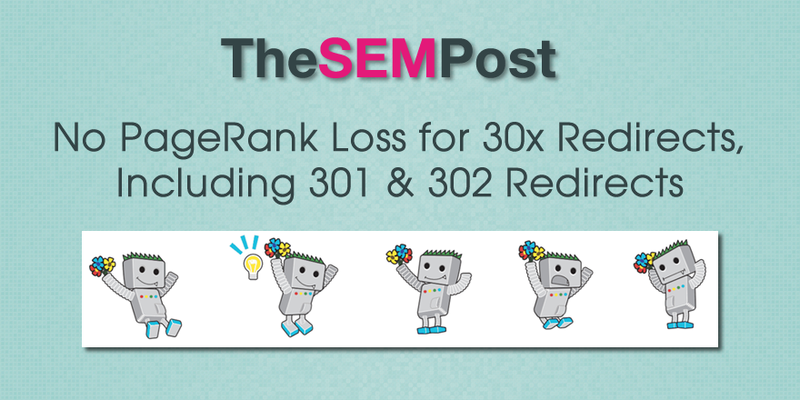 There has been a lot of debate on the issue of 301 versus 302 redirects over the years, specifically regarding the loss of PageRank. Gary Illyes from Google has confirmed now that when you are using a 30x redirect – such as a 301 (permanent), 302 (temporary) or 307 (temporary) redirect – that the destination page will not lose PageRank from the intial page. In today’s hangout, John Mueller also confirmed this has been in place for a while, so this isn’t “new” per se, and does confirm what Mueller has said recently about it not mattering whether a site owner uses a 301 or 302 redirect when it comes to PageRank value. Gary Illyes also said earlier this year that website owners should use the redirect that is the best choice for their site, and Google had also confirmed that moving to HTTPS would not result in PageRank loss. Despite what G says, it does still matter, if you use a 302 redirect (like my company uses by default) the old URL stays in the index. I’m sure there are a bunch of other similar back-end crawling issues. I’d recommend sticking with the “best practice” of using the 301 unless circumstances deem otherwise. Thanks for the article! I suggest people use this with caution as there are other implocations. For example using a 302 Google will kerp and display the old URL but transfer value to new pages. This can be confusing to users if you change domains, categories or http to https and yhe old version shows in SERPS. Note the do this because they expect you to return to the original URL at some point. That is interesting to know, although I am far from convinced it is the best way to create the best results. Majestic has no immediate plans to emulate that in its own Trust Flow calculations. As far as I am aware, we do not pass Flow Metrics through a 302 and DO “MOSTLY” pass Flow Metrics through a 301. There is a significant section of the SEO community that set up 301 daisy chains and after a while this should be a decreasing signal of quality (and probably an increasing signal of manipulation). So I am happy Majestic is going its own way. I don’t know how many people care, but I thought I would share. Gary Illyes’ and John Mulller’s comments are both specifically limited to PageRank and neither of them (at least not in the quoted extracts above) has said that it doesn’t matter from any other point of view so one still needs carefully to observe the distinction.